DOUBLE DOWN – A.K.A. 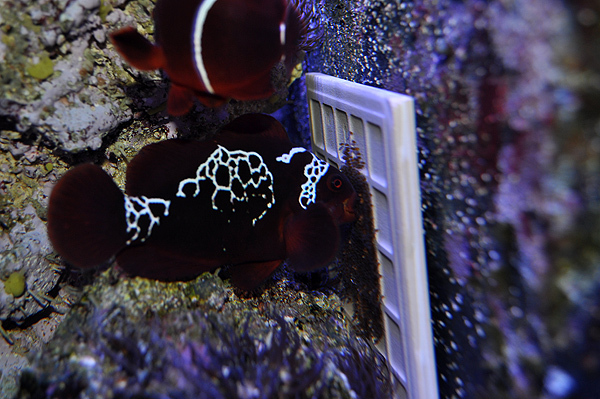 these are NOT Lightning Maroon Clownfish Eggs! This has been an interesting weekend for the Lightning Maroon. It started Friday AM, when I woke up to find the Lightning Maroon with a cloudy and swollen right eye. That alone ruined my day, although I didn’t freak out because I realized that this was likely a bruise / mechanical damage. Still, in the name of precaution, I fed the tank Dr. G’s Anti-Bacterial frozen food, and am following the regime for that just to be sure and hopefully safe. It is now Sunday night, and the eye has all but returned to normal. Now, this is probably something like their 200th spawn (I stopped counting years ago). Up here, we don’t have a huge market for Onyx Perculas (or any clownfish) so at best, I might raise a batch every year now. 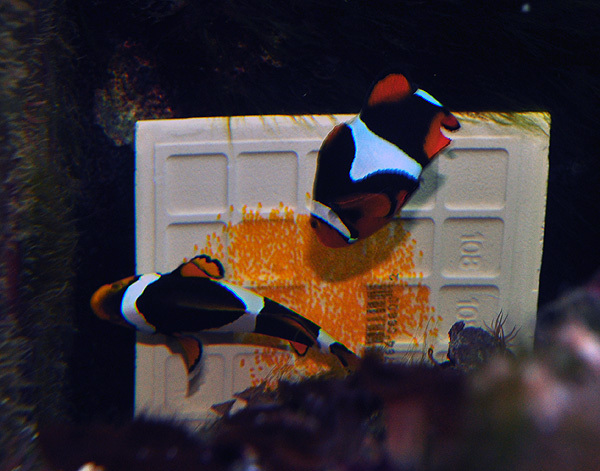 This time, I had been waiting to do something in the “bag of tricks”, something clownfish breeder Mitch May (a.k.a. Booyah) likes to do, called a “Double Down”. I *think* I’ve mentioned it here before, but if not, well, here’s a synopsis. 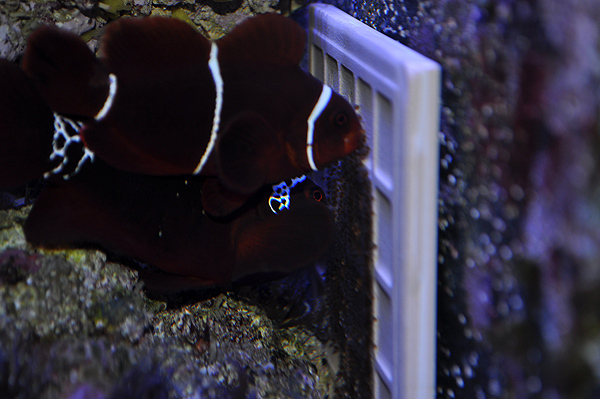 The jist of the “Double Down” is to take the nest from an actively spawning pair of clownfish and give it to surrogate or foster parents, in this case a pair of clownfish that has yet to spawn. As Mitch tells it, they’re generally going to do one of two things. Tend the next, or eat it. If they eat it, no harm, no foul, the eggs are stellar nutrition for the non-spawning pair. If they tend the nest, Mitch relayed that he’s found that it helps a reluctant pair to “get the idea”..that is to say, it often kicks them into spawning mode in short order. So tonight, about 48 hours after the next was laid, I pulled it from the Perculas and gave it to the Lightning Maroon Pair. 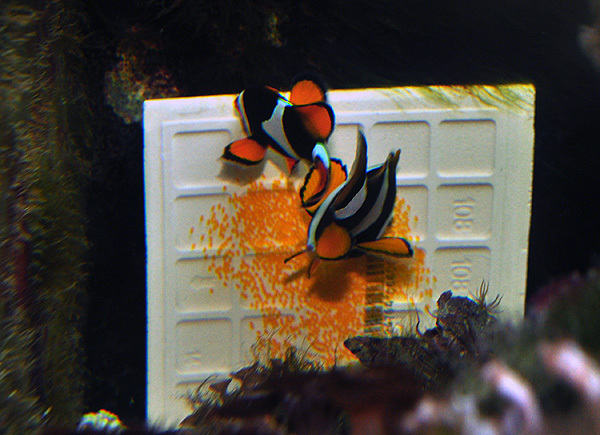 The Onyx Percs are my longest living pair to date…they were the first pair of clowns we got when my wife gently nudged me into setting up a saltwater tank for her way back in the day. They come from a tank that hasn’t seen a new fish in 9 months (and that “new” fish was removed about a month ago). So it’s a solidly reliably, trustworthy tank. Now remember, the PNG Maroon that was paired with the Lightning Maroon is in fact a fully functional male Maroon that was successfully spawning while paired with a large Gold Stripe Maroon (this temporary pairing was set up to prevent the PNG maroons I received from turning male). I had very little doubt as to the male’s ability and instincts. The nest went in with the Maroons, and initially, the Lightning tried to push the tile out of her territory. I put it back, only to hear it whack against the glass. Did it again, and this time took video. 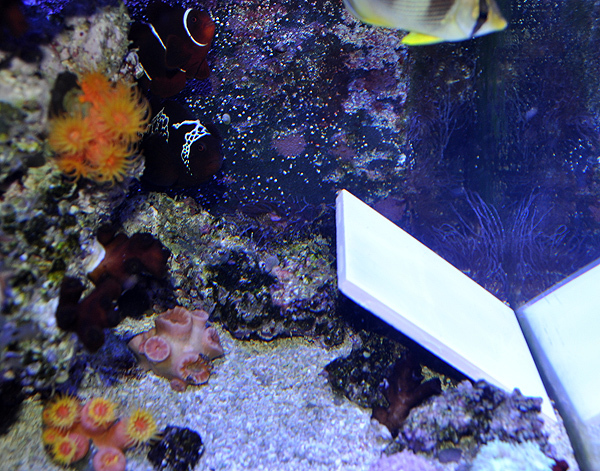 So I really wedged it into the gravel, with a large rock pinning it up flat against the back of the tank, in the general area that they normally clean. It’s probably been an hour now, and I haven’t heard the tile get thrown against the tank glass again, so hopefully it will stay in place. Hopefully. At any rate, once the tile was in place, it seemed pretty clear that the Lightning Maroon was having mixed feelings…given that she is tending the nest occasionally with the male. Let me once again be undeniably, crystal clear. 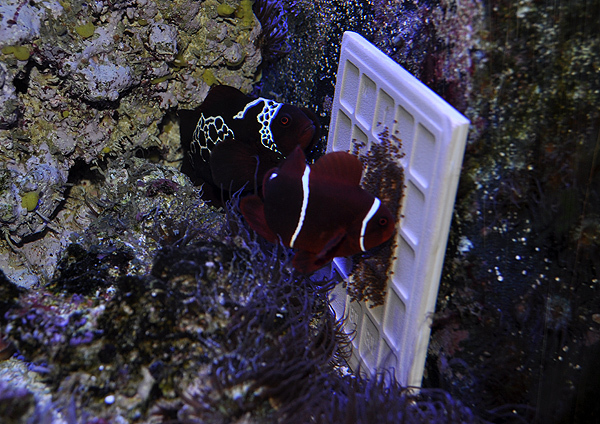 THESE ARE NOT LIGHTNING MAROON CLOWNFISH EGGS, they are PERCULA eggs being FOSTERED by the LIGHTNING MAROON PAIR. I admit, it’s pretty cool to see even if it isn’t their own eggs…yet. Written by Richie about 7 years ago. 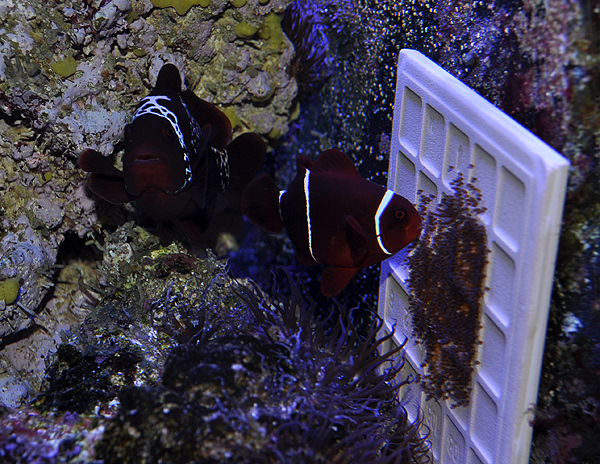 Written by Lightning Maroon Clownfish | Saltwater Aquarium about 7 years ago. Written by William about 7 years ago. Good luck. I really hope we get to see a batch of lightnings soon. It is too stunning a fish to not breed and spread. Written by Gale McKamy about 7 years ago. Hey Matt, at what temperature is your Apex controlling? It’s great to see the lightning tending some eggs……at least you know she knows how to care for them Good luck with the spawning. Oh My Gawd! The Lighting Maroon !$3@^D eggs… ha ha. It’s cool to see the maroons tending the onyx nest. I was going to ask how Dr. Sanjay and Tal’s visit went a few weeks back. Also, not to be a PITA but the word “next” appears in the post instead of “nest” a few times. 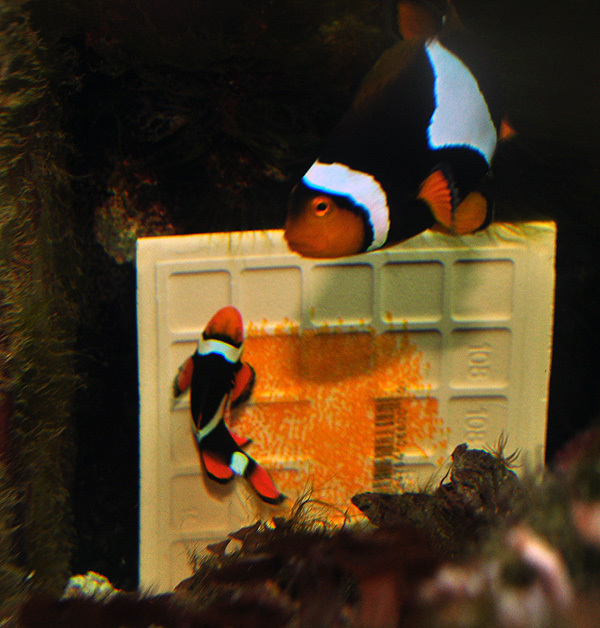 Written by Clownfish are finally breeding – Page 3 about 6 years ago.